About 80 firefighters battled the blaze, which spread to the second floor and a camper in the driveway at the Yarnell Street address. A baby was taken to the hospital Tuesday after a Brentwood house fire that left about 15 people homeless and destroyed a camper, authorities said. The occupants inside had escaped and flames were burning the rear of the first-floor home on Yarnell Street when firefighters arrived at about 2:50 p.m. and snaked a hose through the front door, authorities said. It's unknown how many people were in the home when the fire broke out. 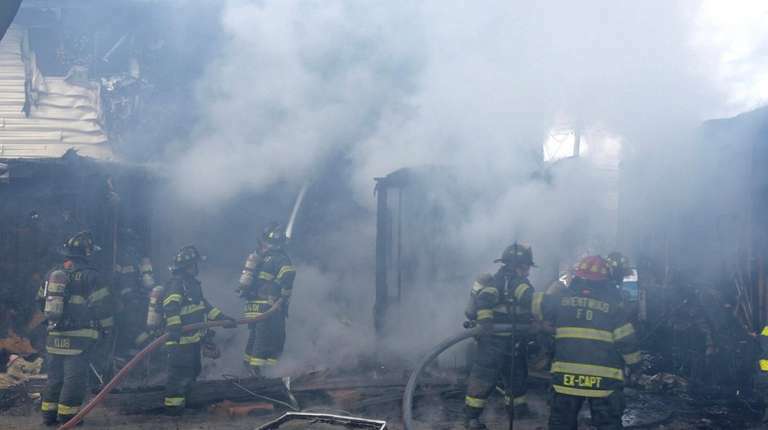 The blaze spread to the second floor and a camper on the driveway burst into flames due to the heat from the fire, said Edward Kelly, second assistant chief of the Brentwood Fire Department. About 80 firefighters, including those from Bay Shore, Islip and East Brentwood, knocked down the fire in less than 30 minutes, he said. A baby was taken to the hospital by the Brentwood Legion Ambulance to be checked for carbon monoxide poisoning, Kelly said. The injuries were considered not life-threatening, an ambulance company spokesman said. The child's condition was not immediately available. No other injuries were reported, authorities said. Suffolk police said about 15 people lived in the home.